BML Istisharat started as a consultancy company in 1972. The war in 1975 changed many things including the activities of BML Istisharat. Since then, the company has been provising the Lebanese banking sector with IT solutions. BML Istisharat began to export its products in 1980's and became partners with IBM or HP. Today, 87% of its business lies in exports and only 13% in the local market. Its main activity is to develop and support application software geared towards Banks, Insurances, Manufacturing and Distribution firms. 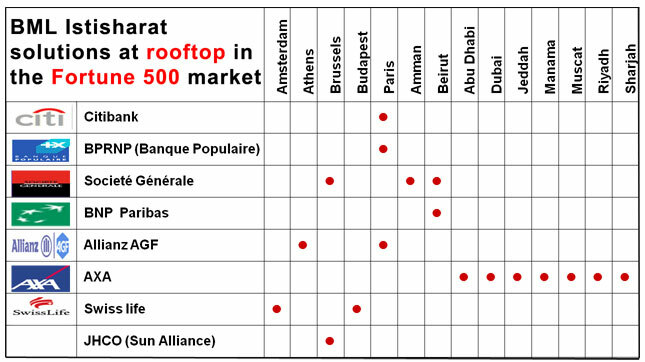 Today, proven solutions of BML Istisharat are being used by more than 300 clients worldwide, including Fortune 500 companies, in order to achieve their business goals. BML Istisharat is ISO certified and Oracle certified and the company is an IBM business partner, too. To be recognized as a partner of choice for financial information systems geared towards banks, insurance and manufacturing companies. To constantly update such systems in close cooperation with users groups and industry professionals. To share with our partners / customers a common goal for consistent achievement, mutual profits and personal success. BML Istisharat is architect of its products and solutions and fully own them. All products are developed in-house, Implemented on-site and supported directly by BML Istisharat. BML Istisharat is in forefront in providing business solutions and IT services. BML Istisharat state-of-the-art international and universal business solutions are operational in the United States, Canada, Europe, Africa and the Middle East. ICBS was designed as a set of integrated modules that share a common nucleus in order to cover Retail Corporate and Investment activities. The ICBS Nucleus encapsulates all other modules and provides security features, dynamic personalized menus, referential and parameter tables, user defined business rules, central customer information tables, accounting system, audit trail reports and a set of embedded engines and calculators: (Accounting, Receipts, Documents, Commissions, Charges, etc.) as well as interfaces with peripheral applications (SWIFT, ATM/POS, IVRs, CRM etc.). Completely user defined transactions to handle tellers and back office retail activities including current balances and checking accounts, savings accounts, time deposit, overdrafts, commercial bills, standing instructions, utility bills, cashiers/draft checks, remittances and transfers, etc. Personal, Consumer and Corporate financing. Dynamic scoring and user defined products. Origination and approval workflow. Follow up, settlements/collection, rearrangements and arrears management. A set of modules offering complete workflow (maker/checker concept), follow up, generation of accounting entries and documents through a rich set of functions covering letters of credit, bills for collection and letters of guarantee. Wholesale transactions: spot, forward and swap, certificates of deposits, loans and deposits (fixed and call notice) with related transfers. Front, Middle and Back Office: Handling of Stocks, Bonds, Derivatives and Mutual Fund transactions, On-line interface with pricing systems. Credit Files, collateral management and facilities. Risk classification and monitoring. Flexible and multiple interest calculation methods. Regulatory reports and data exchange with credit bureaus. Correspondent accounts management. Batch processing including: Periodical closing, Reconciliation, Revaluation and Consolidation. Rich set of reports (Control, Statistics and MIS). The Policy Administration module is the home base of customer activities. This area contains most immediate contact information as well being the primary customer inquiry and service area. This module is used to answer billing questions, process endorsements and most other customer service procedures. Designed for comprehensive claim management the Claims module seamlessly interfaces to the policy database as well as the accounting module. This allows smooth and accurate claims handling. This module starts with claim set up and tracks the claim through to closing. This module is designed to handle the most complex reinsurance issues and is available as part of the enterprise wide system or can be integrated to other vendor systems. The Life Insurance and Reinsurance Integrated System (LIRIS), was developed in cooperation with several life insurance companies and was designed from the start to handle both traditional and unit link products. The first installation dates from 1990. The system handles conventional, universal life and unit link life policies. There is full support for Term, Endowment, Pure Endowment and Whole Life covers. A policy has one and only one product but under a given product we can have any combination of covers; For example it is possible to have under one policy a Term cover, a Whole Life cover and an Endowment cover. The actuarial calculations are triggered on specific events. The events are inside the LIRIS Programs but the calculation needed for the event is outside the LIRIS programs thus allowing to add new products along with their calculation formulae without changing the core system since the calculation formulae are 'plugged-in' and not hard coded in the programs. The Commercial, Net, Expense loaded, Zillmerised and Investment premiums are calculated by cover using either user defined tables, standard calculation routines or even customized routines. The Surrender Value at Last Anniversary, Last Anniversary profit sharing, Reserves before Alteration and Reserves after Alteration and the Guaranteed Maturity Values are calculated on-line when applicable. Covers validation rules like minimum age at entry, maximum sum insured, cover type, period of premium payment etc. can be specified for every newly introduced cover. There are primary covers and secondary covers. Secondary covers can exist on their own on a policy (example: Accidental Death Benefit) and they can also exist as riders on primary covers (Premium restitution on a Pure Endowment). A product will contain one or several covers and riders. Not all the covers of a product are mandatory (they may not all exist on a specific policy). Age and range of sum insured can define medical requirements and insurability requirements. Using the total sum insured on a given life, the system will suggest the appropriate medical examinations to be followed, showing also the exams already performed. Commissions rates are defined by source of business (commission agreement), product and cover. There may be up to 9 intermediaries on a policy each having up to 4 levels of overrides. The splitting of both the initial and renewal commission is defined on the source of business level. The initial commission can be calculated by the value generator where several parameters for a given intermediary or source of business can be taken into account. The above system allows the full support of bank warm leads commission, where a source of business is defined for each bank deal. In the source of business, will be defined the commission percentages as well as the splitting rules between the bank and the intermediary (if any). The initial commission and overrides can be paid and earned in several ways. As a matter of fact, the initial commission and overrides can be paid and earned by user-defined schedules. The payment and earning of the initial commission overrides can and also be defined by type of intermediary. Liris has being extended to operate in a Bancassurance environment. This resulted in a definition of the Front Office functions at Bank Branch level, the Bank Office functions and the exchange of data between the Banking & the Insurance system. The end result is that LIRIS can be integrated in a banking environment, in a way that the same bank employee can handle banking & insurance products on the same workstation. LIRIS supports different claims types: Death, Maturity, Critical Illness and Invalidity claims. The user can define as many claims nature as needed but each claim nature must have one and only one of the following types: Death, Accidental Death, Suicide, Maturity, Critical Illness (dread decease) or Invalidity Settlement of claims can be done by lump sum or annuities. The reinsurance is done by product/cover using the aggregate retention on a life insured. There can be a quota share treaty followed by several surplus treaties or an automatic treaty. Reinsurance risk premiums can either be calculated by using formulae or tables and they are defined in the value generator (described earlier). The Industrial Manufacturing and Distribution system (IMAD) is a modular software package supporting the financial, administrative, production and distribution activities of Manufacturing and Distribution Firms. The first version of IMAD was implemented in 1981. Today, IMAD modules are successfully running at 100+ firms operating in both Manufacturing (Cement, Furniture, Fertilizers, Cosmetics etc.) 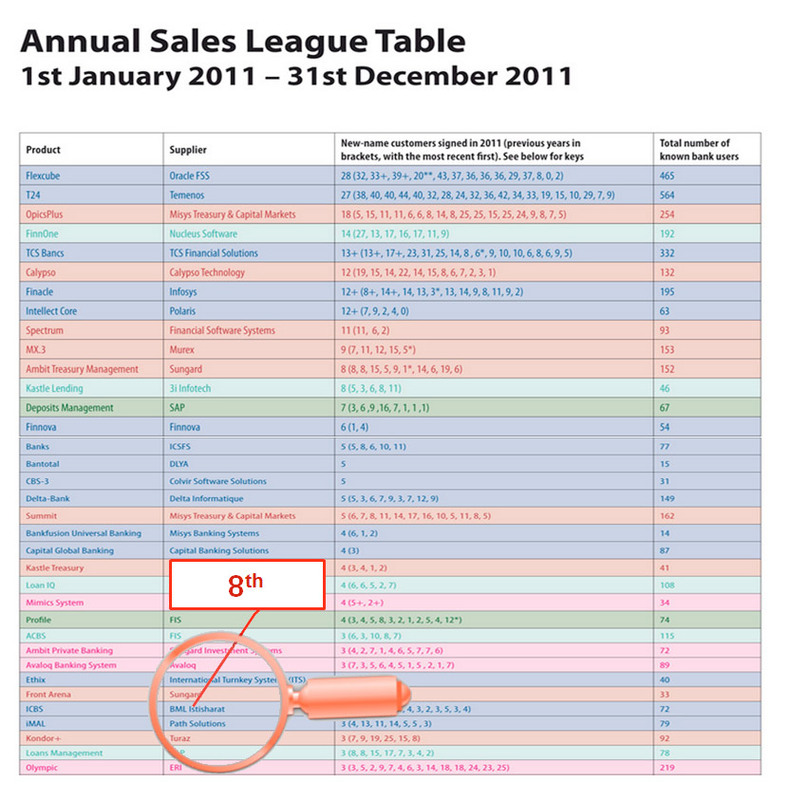 and Distribution (Car dealerships, Home Appliances, Heavy Machinery, Pharmaceuticals etc.). User friendly, modular, integrated, secure, flexible, parameterized, multi-currency, multi-lingual, multi- ompany, multi-branch, on-line, real time, RDBMS based and fully documented. Modules can be installed on a stand - alone mode. · Analysis by account, cost center, department etc. · Follow up: Placement, Reception, Situation etc. Joe Faddoul, Chairman of BML Istisharat, reveals the strategy for his company: "We want to consolidate our new markets and continue to be up to standard on a technical level." Lately, BML Istisharat has signed its first deal with a local bank in Malaysia. 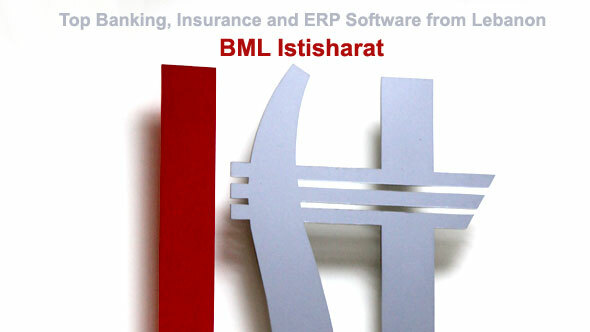 The software from BML Istisharat has been already implemented in more than 30 countries to more than 300 clients. 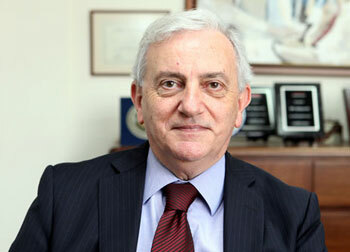 Mr. Faddoul wants to focus on Russia, the CIS countries and Asia over the next 5 years. BML Istisharat is an example of a boutique company. Not being a global heavyweight has its advantages though. Thanks to its small size, BML Istisharat more reactive, agile and can adapt more easily and flexibly. Mr. Faddoul describes the company in the following way: "We are an equivalent of a boutique hotel in the world of IT, banking and insurance: we pamper our clients and build a personal relationship with them." 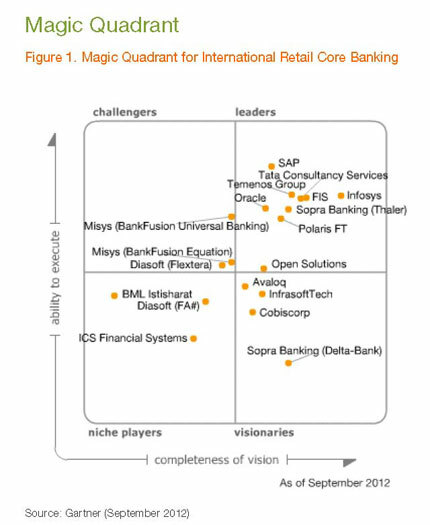 Gartner's Magic Quadrant affirms the reputation of BML Istisharat. "What you need to know: ICBS is a complete core bankingy system, the main characteristics when compared to competition are ist flexibility, its wide functional coverage and its simplicity of usage. It is also worith mentionintg that ICBS is available on two platforms IBM-AS/400 on DB2 and different Oracle platforms." The latest annual rating of International Banking Systems - United Kingdom (IBS Sales League Table) for the year 2011 ranks ICBS, the banking system of BML Istisharat, as 8th out of 34 systems selected for Universal Banking, and 14th out of 78 in all categories. Moreover, BML Istisharat has been selected by Gartner Inc. in the Gartner's Magic Quadrant (MQ) for International Retail Core Banking. Positioning was based on the BML's completeness of vision and its ability to execute. - The World Bank awarded BML Istisharat the contract for the computerization of the Land Registry Office. 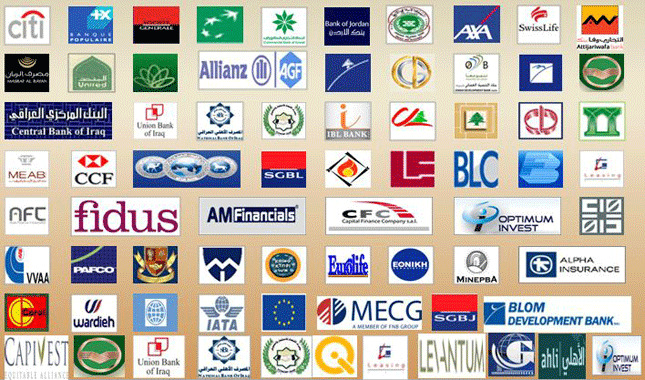 - The European Union selected ICBS for a major bank in the Middle East. "ICBS required powerful, sophisticated hardware technology with strong overall performance, large memory capacity and disk space. The hardware had to handle larger file sizes and additional functionality. We needed a reliable, scalable, easy-to-use solution that would deliver a good return on our investment. The AS/400 platform gave us the powerful solution we knew we could trust. With BML and AS/400 technology, we now have a state-of-the-art network computing systems that allows us to compete with any bank in Saudi Arabia." 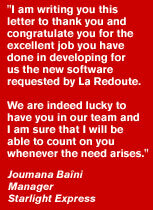 "I want to express my positive appreciation for your cooperation and my satisfaction for your services"
"I am writing you this letter to thank you and congratulate you for the excellent job you have done in developing for us the new software requested by La Redoute. We are indeed lucky to have you in our team and I am sure that I will be able to count on you whenever the need arises."